States with new poll data added since the last update: All 50 states and DC. It has been about two days since the last update. While there are mixed changes since then, on balance this is a good update for Trump, and the race looks closer than it did two days ago. 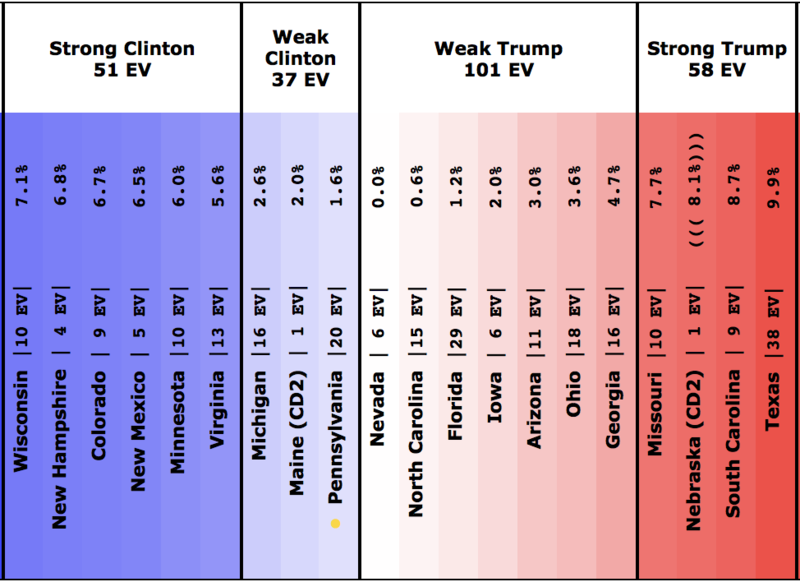 The expected case moves from Clinton winning by 108 EV to Clinton winning by only 8 EV. The fact that Trump’s best case is getting worse is pretty much irrelevant. Either candidate winning all the close states is a very low probability event. A few months out it is good to show how things might reasonably move. 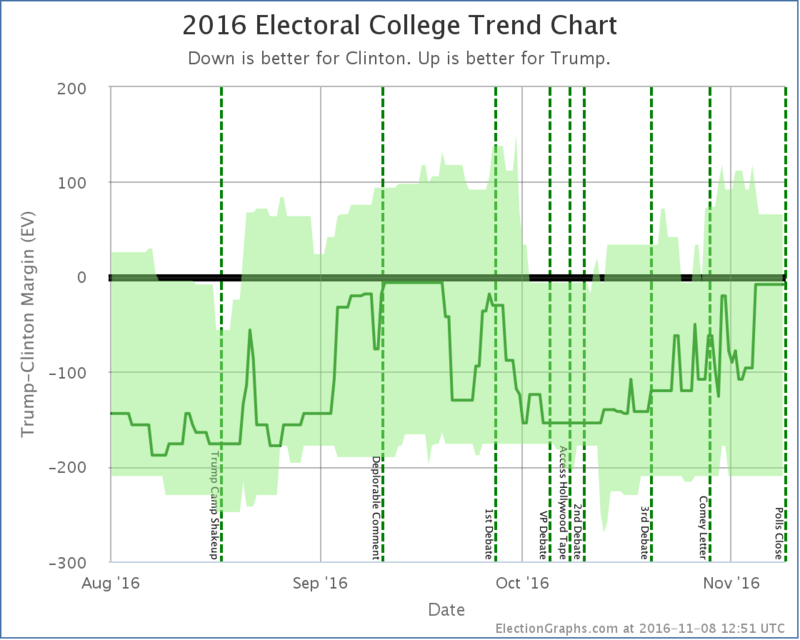 But on election day, the expected electoral college and the tipping point are the two numbers to watch. 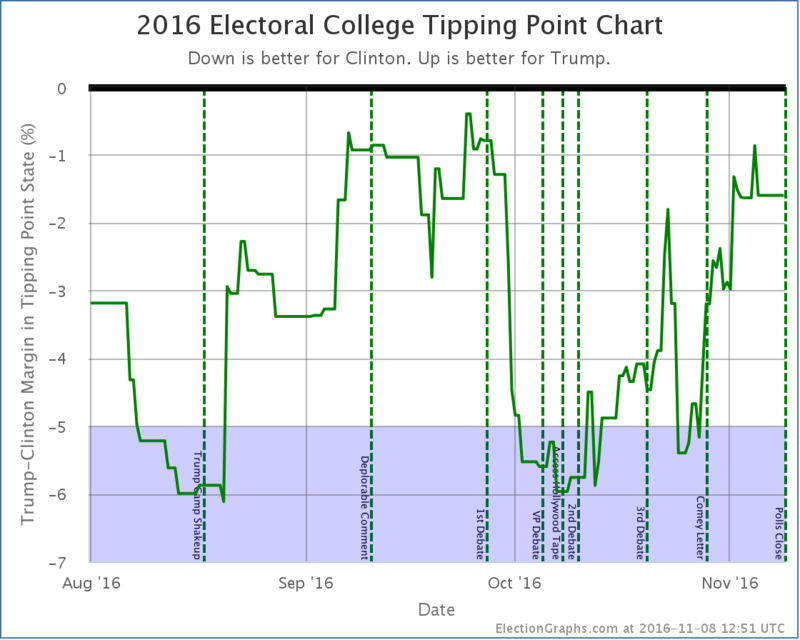 In the last update I speculated that because the tipping point and expected electoral college votes were going in different directions Trump may have topped out. But the movement toward Trump seemed to have a little bit of life in it yet. 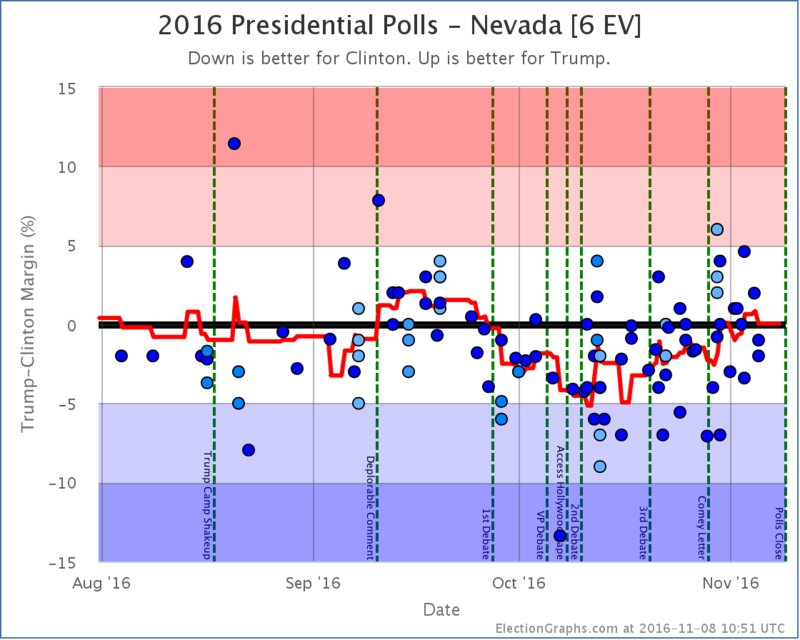 With the latest batch of update, the Election Graphs poll averages for Florida, North Carolina, and Nevada all move from just barely blue to just barely red. And the tipping point gets a bit narrower too. …and the numbers say that it is looking very close again. In the expected case Clinton wins by only 8 electoral votes. 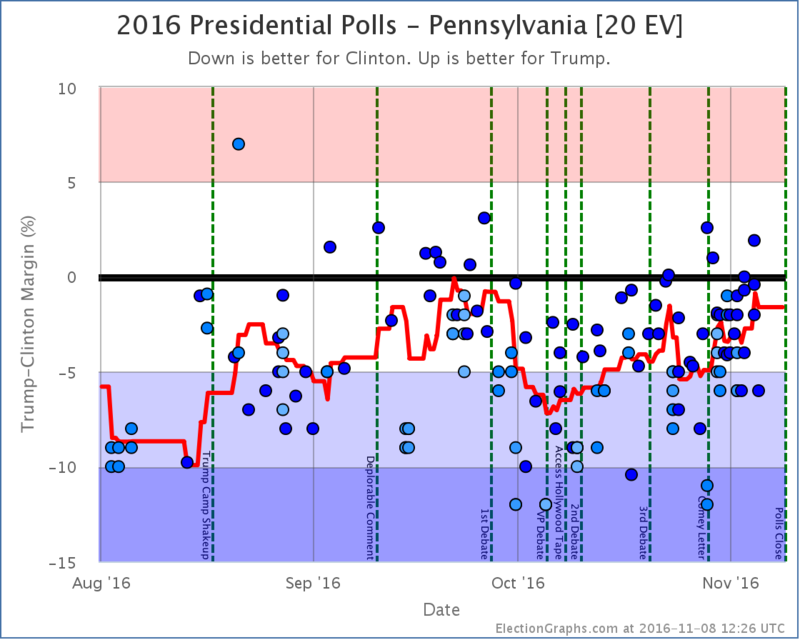 To flip the election, Trump only has to win Pennsylvania, and Clinton’s lead there is down to 1.6%. The tipping point margin isn’t quite as small as it it was in September when it was down to 0.4%, but it is close enough that you could easily imagine a Trump win. Right? The median estimate of Trump’s chances 2 days ago was 12%. Now it is 14%. So, slight increase, but not a huge one. And if you look at the individual estimates above, many actually went down since two days ago. But if everything is closer, why? Well, each of the models of course have their own methods, and the movements in each would have a different explanation. Some of them discount or don’t include at all some of the pollsters showing the Trump movement that has moved my averages. 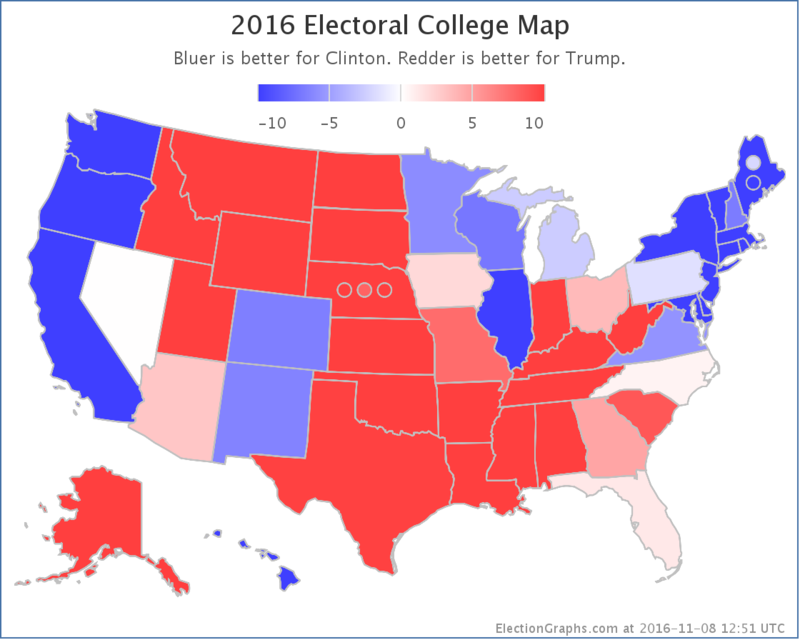 But just looking at the state of the race as a whole instead of specific models… Trump has never been ahead in the electoral college, by most measures he hasn’t ever led the popular vote either, and he’s also never led in Pennsylvania (or the other further off states he would have to flip to win). So even taking the averages here at face value, and not doubting the status of Florida or Nevada, to win Trump would still need to break his September ceiling and do better than he has done at any time in this race so far. That is possible, but not likely. Add to that the indications of high Hispanic turnout in several states, notably Florida and Nevada, and that some of the recent polls may be intentionally skewed… and it seems like if someone over performs their polls, it is more likely to be Clinton. But that is looking at things other than the polls themselves. All and all, the new median of a 14% chance of a Trump upset seems about right. Maine CD2, Pennsylvania, Nevada, North Carolina, Florida, and Iowa are all within 2% at the moment. They could still go either way based on the current averages. That is enough to swing the election. So, as has been the case for awhile, a Trump win would be surprising, but should not be shocking. Trump has a path. We shall all see soon enough. 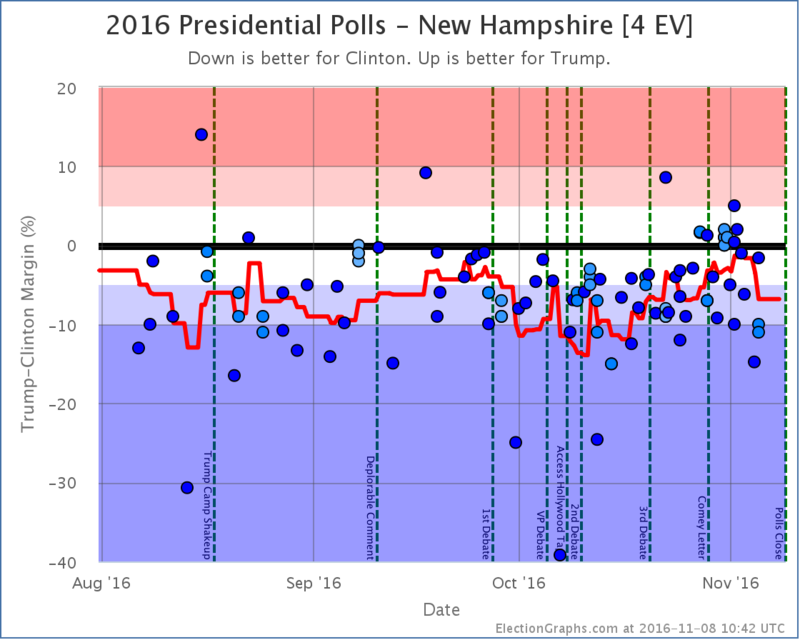 In New Hampshire we already have some results of course… Dixville Notch, Harts Location, and Millsfield have already reported results. The totals: Trump 32, Clinton 23, plus a handful of votes for others. So there you go. For real meaningful results, we now have less than 8 hours until parts of Indiana and Kentucky close. Then less than 9 hours until the first full states close and the states start getting called one way or the other. The following are the detailed charts for all the states that influenced the national changes outlined above. In the past few days there have been reports of first one, then two, expected electors from Washington state saying that that have decided to or are considering being “faithless electors” by voting for someone other than who they are “supposed to” when the Electoral College votes in December. Yes, they can do that. In Washington state there would be a $1000 fine if they did, but they can do it, and it would count. There was also one other potential elector from Georgia who suggested they would be faithless back in August. That potential elector came under extreme pressure and resigned, to be replaced by someone who would presumably vote the “right” way. That might well happen to these two as well. But faithless electors can and do happen every few election cycles. In the last 50 years there were faithless electors in 2004, 2000, 1988, 1976, 1972, and 1968. That is 6 out of 12 elections during that period. Half. It would not be surprising if there were one or more faithless electors in 2016, especially given the contentious nature of the race. They have never made a difference in the final outcome. 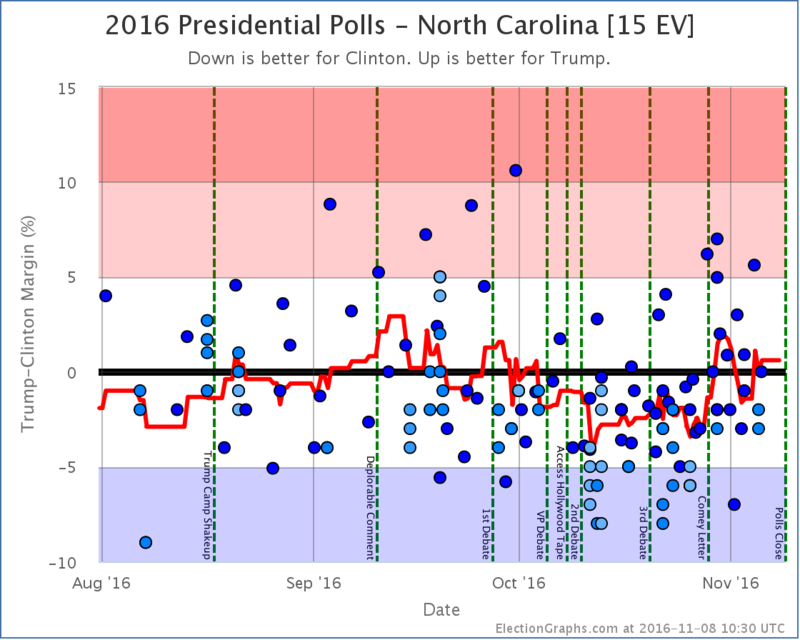 The Election Graphs estimates show what the results “should be” given who wins various states. They do not take into account statements by individual electors on their intentions. If a scenario arises where it is close enough for electors who have made statements like this to potentially make a difference in the outcome or throw the race to the House, we will of course make note of that. And once electors vote in December, we will show the final tallies, including any votes cast by faithless electors. Right now the Real Clear Politics average in Utah has McMullin 12.4% behind the lead. The 538 average in Utah has him 9.4% behind the lead. Although McMullin was a lot closer than anyone expected, he never got closer than 5% to the lead in Utah in these averages and now appears to be fading. 538 still has him in second place, but it doesn’t seem likely at this point that he will win electoral votes. This post is an update based on the data on ElectionGraphs.com. 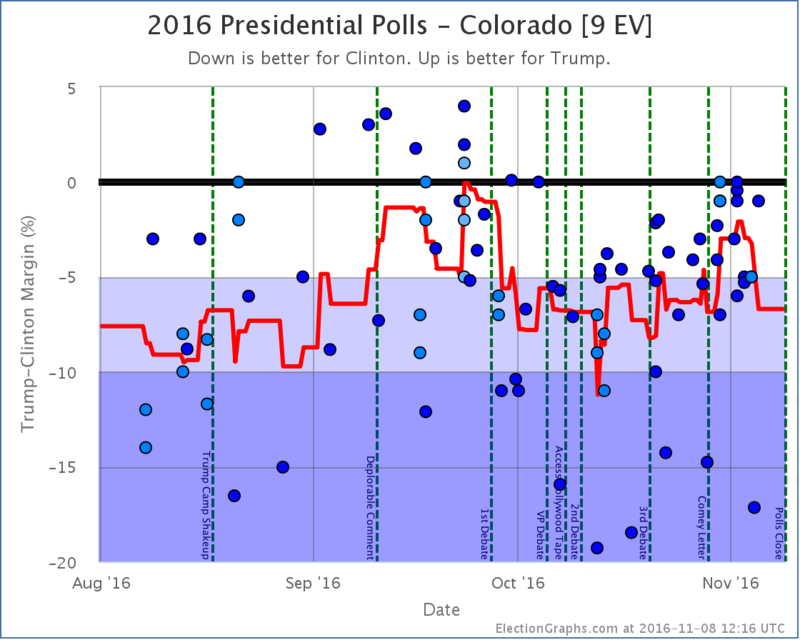 Election Graphs tracks a state poll based estimate of the Electoral College. All of the charts and graphs seen in this post are from that site. Additional graphs, charts and raw data can be found there. Follow @ElectionGraphs on Twitter or like Election Graphs on Facebook to see announcements of updates or to join the conversation. For those interested in individual general election poll updates, follow @ElecCollPolls on Twitter for all the polls as they are added. If you find the information in these posts interesting or useful, please consider visiting the tip jar. In spite of Pravda-style “journalism” from CNN, ABC, CBS, NBC, MSNBC, the New York Times, and the Washington Post, Trump can win. I believe that in a fair election — which means among other things all voters have all the relevant information — Trump will definitely win. I wonder what will be the fate of the Soros-globalist media machine if this election is stolen thanks to their biased reporting? Makes you wonder, does it not? Remember what Jesus said. “I come not to bring peace but the sword.” We are part of the cosmic war between good and evil. When democracy fails, there are alternatives. Let’s hope Trump is victorious! Fascinating to watch the graph here go from “the only question is by how much Clinton will win” to “could easily imagine a Trump win”. I’m curious about the notion that certain pollsters are purposefully releasing Republican leaning results at the last minute. 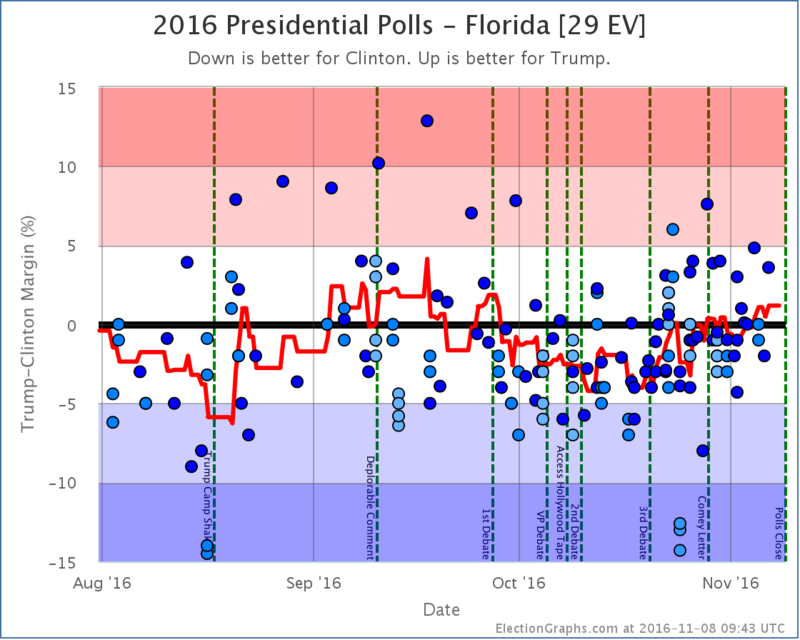 In particular, I notice that Florida seems to have been tipped by a pollster called “Trafalgar” which has a “C” rating from 538. They may not be very good at polling, but are they actually part of a conspiracy? I’m so sick of conspiracy theories these days (to whit, read the post from Karl above), that I’m more likely to apply Halon’s Razor: “Never attribute to malice that which is adequately explained by stupidity”. Well, I really do think the only real question is how much Clinton will win by. But I acknowledge the odds of a Trump win have increased from the low single digits when I originally made that comment to the low teens now because Trump has made a decent comeback in important states. (The popular vote has moved much less.) But it is still much much more likely that Clinton will win. A Trump win still requires a bunch of things coming together for him at the same time, which while not impossible, is unlikely. And given where he was when I made that comment, it would indeed be an unprecedented comeback and/or polling error. Oh, and I’m also dubious of conspiracies. It may just be that these various pollsters just started releasing results toward the end of the election. But there are a couple of them, they have been releasing results only in the last few weeks, and they all are Republican pollsters whose results are more favorable to the Republican than the other polls, so the effect is the same if it was a conscious plan or not, they move averages that include them toward their candidate. 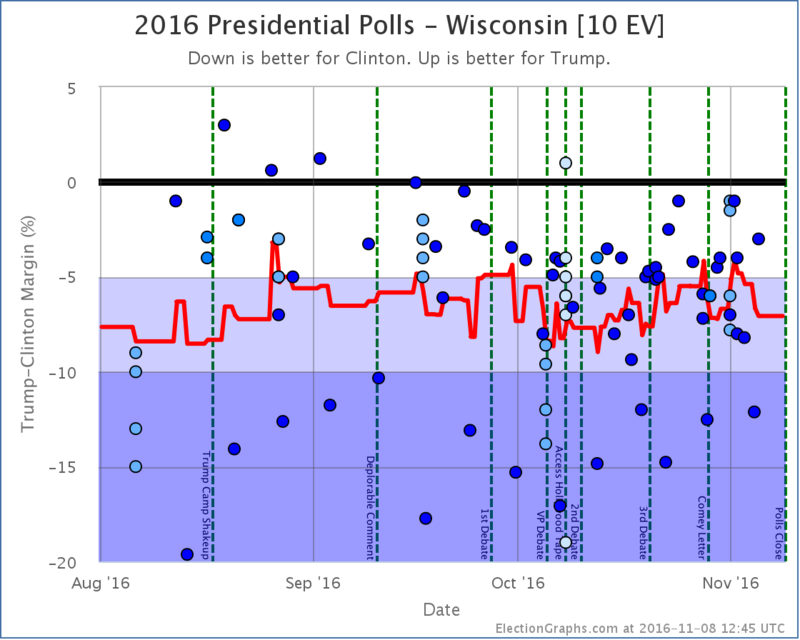 “In a fair election Trump will win”…??? All of the above examples have been actually, or alleged to have been, committed in support of the same candidate. Guess who HE is! Is there any way to find who commissioned those polls? Someone had to pay for them, so that might give an idea why they all lean one way!